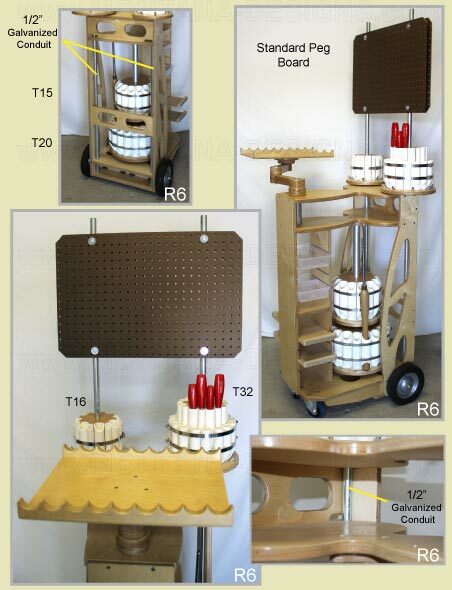 Woodturners R5-P Tool Cart "Plans"
Home > R5-P Tool Cart "Plans"
The original Woodturners Tool Cart “R4” was first introduced as a kit (we now offer a "R6" kit ) in the December 2011 Journal of the American Association of Woodturners. Over the last year we have had a number of turners asking for plans so we revisited the design and now offer the R5-P as plans only. The R5-P is the 5th generation tool cart. Improvements in manufacturing of “kits” and feedback from users have been incorporated. 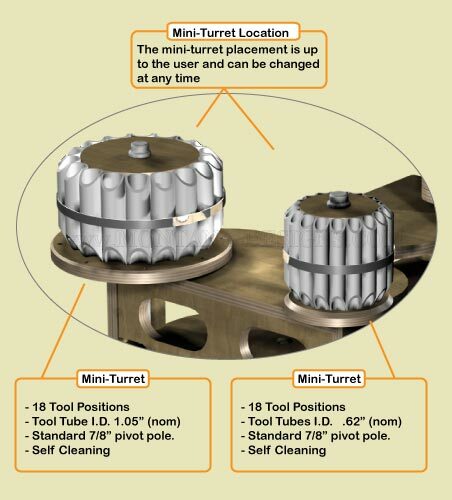 One notable feature of our turrets is the unique “tool stop”. The tool stop carry’s all the vertical loads of the heavy tools and will brush off abuse, such as dropping tools etc. The tool shelves are 5 3/4" wide and are adjustable in 2" increments to accept tooling (chucks). The tool cart is ambidextrous and can be placed to the right or left of the turner. The chassis is very robust and will carry >200lbs of tools and accessories. Total gross weight of the cart should not exceed 300lbs. The plan-set consists of 5 large sheets (22” x 34”) detailing all aspects of the design in clear, uncluttered line drawings. Components are shown to scale (typically 1:4). The entire 1st page contains 25 detail graphics and over 3000 words spanning 80 step-by- step instruction delineating the building sequence as well as hints to make the job easier. The accuracy of the plan-set is proven. All you have to do is cut the parts to specified sizes and it will fit precisely together. The Plan-Sets are shipped rolled in a kraft tube. 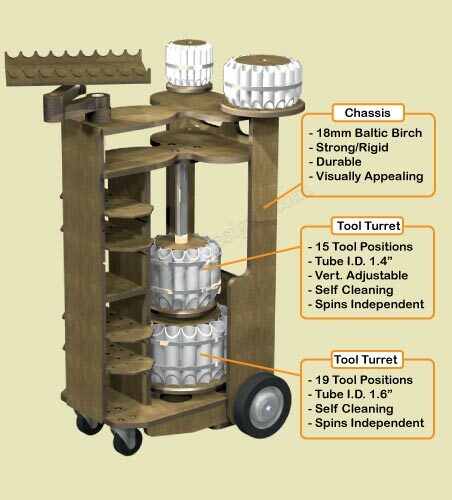 We think the ultimate tool cart would provide power, vacuum source, ventilation, lighting as well as storage of all the tooling in support of your turning endeavors. 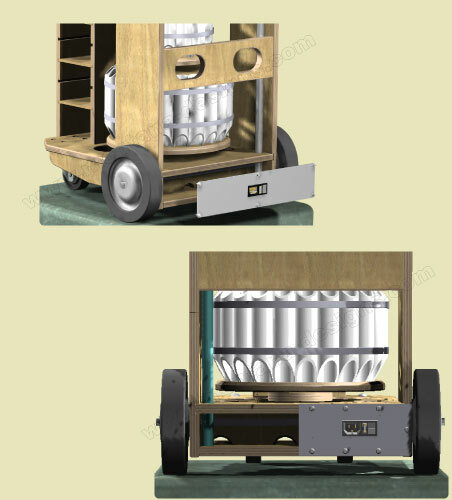 We couldn’t include everything in the standard cart but we think we have provided pathways by anticipating these requirements during the design of the cart. 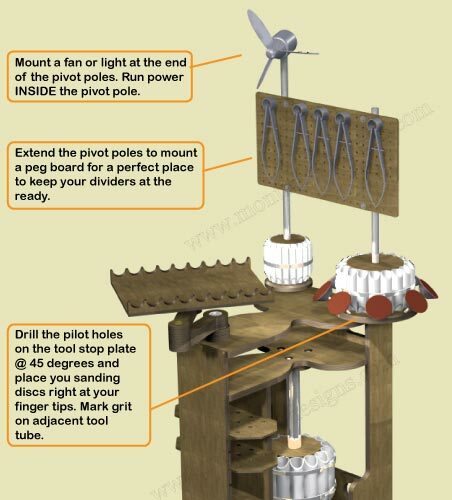 It would be fairly easy to integrate power into the tool cart by using the two vertical pipes (mini-turret pivot poles) as conduits to run power to light or fans. Use one pipe to carry power to a power strip on the front of cart or extend both pivot pipes up and put a fan on one and lights on the other. "Hooks" are in the cart to allow you to achieve this. 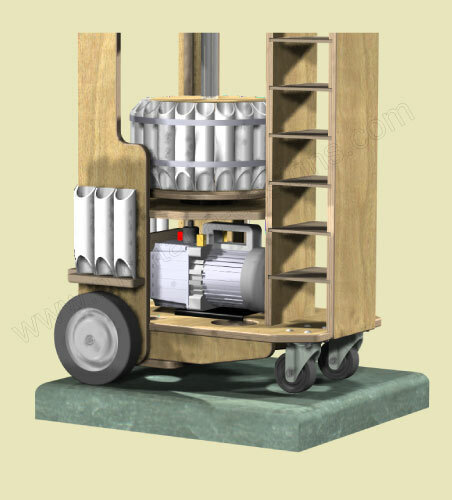 Not everyone needs the full complement of tooling locations that the cart offers. 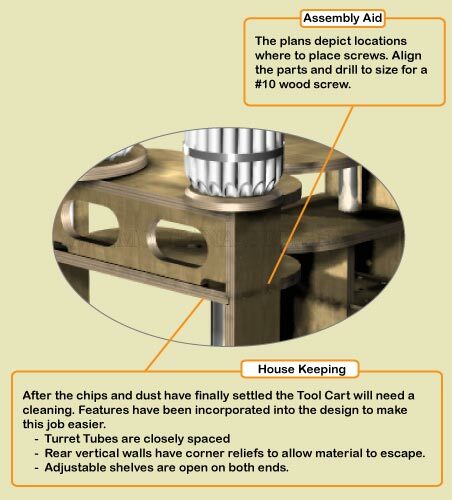 For those that would like to mount a vacuum pump we suggest that you build a shelf patterned after the lower turret board. 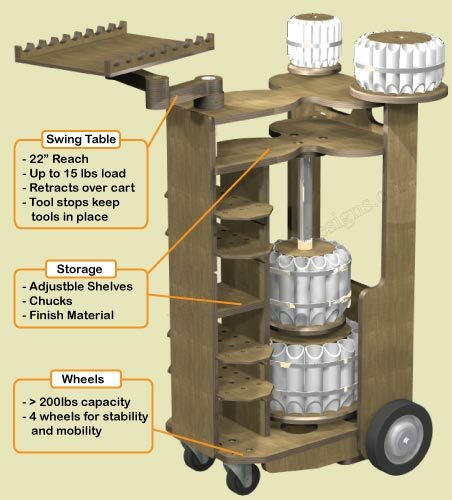 If you need additional tool storage for those really big tools you can side mount tool tubes on the side or back of the cart. Mounting a peg board allows a convient place to store you pre-set dividers etc. With all your tooling centrally contained on the cart its a simple matter to fabricate a drop cloth to cover everything when not in use.